Enabling simple electronic marshalling of pneumatic systems is the ASCO Numatics 580 CHARMs node. Pneumatic systems are an essential part of many process plants, in industries such as chemical, life science and food and beverage, particularly those where ancillary machines are used. Although an essential part of the process, these machines are often stand-alone and are not connected back to the process control architecture. This could mean that should there be a problem with the machine´s pneumatic systems, it may not be communicated back to the control system, therefore leading to a breakdown of the machine. The plant may then continue to produce products that cannot go on for further processing or packaging. Process control systems are normally able to accommodate pneumatics systems through the implementation of an additional fieldbus network, such as PROFIBUS-DP or Modbus TCP. However, this approach adds complexity through additional configuration and data mapping, and whilst supplementary diagnostics is possible, a second programming environment, with its associated costs, is not desirable and may not easily support communication and power redundancy. In 2016 Emerson introduced electronic marshalling for pneumatic systems. 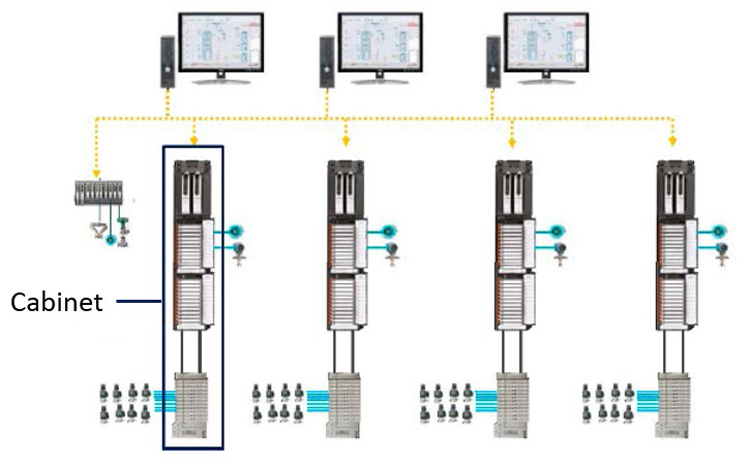 This solution enables users to easily integrate the ASCO Numatics 580 Series valve islands, with Emerson´s DeltaV control system for a complete Emerson Automation I/O and pneumatics system solution for process plants. Control engineers and project managers working on continuous or batch-oriented processing plants will be familiar with the problems associated with commissioning I/O in distributed control systems. The traditional method involves field device connection through multi-cored cabling, wired to terminal blocks in control cabinets, with each connection then manually cross-marshalled to its appropriate I/O card. As system complexity increases and the number of connections accumulates - inevitable I/O changes abound - thus, difficulties arise in keeping track of each and every physical connection in the marshalling panel. Every change adds cost, delays, and most importantly risk to the project. Adding redundancy causes even more headaches. Furthermore, future maintenance and system modification is often made difficult with staff changes and system unfamiliarity, which can adversely affect down-time. Whilst manual marshalling is still considered adequate for small projects, large-scale batch and continuous processes in areas such as chemical, pharma, and food manufacture - where lost production can result in truly excessive costs - increasingly turns to more risk averse and reliable process system design strategies. Electronic Marshalling does away with the manual and labour-intensive practise of cross marshalling. The cables from the field are still wired in to the marshalling cabinet, but from there on in the connections to the controllers are handled electronically. It is now possible to map each I/O channel to any controller. Emerson manage this mapping with their CHARMs (CHARacterisation Modules). These are essentially analogue to digital conversion cards that may be characterised to perform any signal function (AI, AO, DI, DO, RTD etc.). They are ´clicked´ on to CHARM I/O Cards (CIOC), which are in-turn mounted on DIN rail terminal blocks where field wiring is arranged; the field device is identified and the appropriate CHARM card is set up and Electronically Marshalled through a hidden digital bus to ANY controller in the system. Fully redundant power and communications connection is included, and autosensing each I/O channel means that identification, configuration, diagnostics and design changes are easily carried out by the DCS. The technology provides many benefits, from the first design stages, to commissioning, and through the lifetime of processing oriented manufacture. As digital or analogue I/O of any type can be bound to specific controllers at any stage in the project without manual rewiring, hardware and design costs can be more predictable from the outset. Design changes - adding new I/O or changing I/O types - can be catered for without intensive labour and disruptive re-wiring costs. Projects become easier to scale, safety is assured. Configuration and diagnostics are taken care of by a single integrated software platform - Emerson´s DeltaV Explorer. Importantly the Total Cost of Ownership is significantly reduced, measured by increased operational certainty, process reliability and increased machine availability. The 580 Series CHARMs allows control engineers and project managers working on continuous and batch-oriented manufacturing projects a straightforward, cost saving and fast-track approach to the integration of pneumatic systems within the process control environment. The node facilitates single connection from the field to Emerson´s DeltaV DCS offering Electronic Marshalling, native configuration and diagnostics plus built-in redundancy - for a truly integrated system architecture. With the introduction of ASCO Numatics´ 580 CHARMs node, pneumatic systems´ integration with Electronic Marshalling is made possible within a single network platform - a one package and one supplier solution - for the first time. The 580 CHARMs node directly links to the DeltaV system via the CHARM baseplate and natively combines autosensing and Electronic Marshalling through redundant power and communication connection, harnessing the full native diagnostic capabilities of the DeltaV. From the DCS, each pilot valve is managed in exactly the same way as the other system I/O. The DCS can identify and marshal all the pneumatic connections through a single redundant connection with up to 48 valve solenoid outputs connected to each CHARM node. The 580 CHARMs node interfaces with ASCO Numatics 500 Series valve islands. These high performance, ‘plug-in’ directional control valves feature the highest flow capability for their product size, helping to keep machine footprints compact and lowering system costs, whilst a comprehensive range of accessories and options makes for easy installation, configuration and modification. When compared to a manually, cross-marshalled, process manufacturing system for batch and continuous production scenarios, the benefits of a CHARMs technology based solution with Electronic Marshalling are apparent and compelling. When pneumatics require integration, and the solution is compared with the introduction of a fieldbus such as PROFIBUS-DP, the benefits are even more convincing with the easy-to-use, task-based engineering environment that the DeltaV offers. The elimination of a secondary network allows substantial savings in components, associated I/O, wiring, and commissioning time. The Emerson single network solution means single point responsibility for products, documentation and support, with savings for personnel, programming resources and system training. Reduced component count and direct connection equals a reduced risk of system failure. Design changes throughout project development and future troubleshooting is made easier with embedded intelligent control with autosensing and plain message workstation diagnostics. Shutdown time is significantly reduced thanks to integral diagnostics directly on the valve island or displayed on the DeltaV systems workstation. Reliable redundant connection ensures safety and reduces maintenance down time. Further compelling benefits include flexibility in process control thanks to every CHARM I/O from voltage and current sensors to alarms and pilot valves sharing the same DeltaV Explorer configuration, and being available in the ´cloud´ to any controller in the network. These factors combine for a tightly integrated solution for I/O and pneumatic valve islands that delivers more complete project and operational certainty, comprehensive control optimisation and processing reliability.